The Dave Dorman No Tricks, Just TREATS Comic Books Pre-Sale! Happy Halloween everyone!! No Tricks, Just TREATS today… and thru’ the weekend! 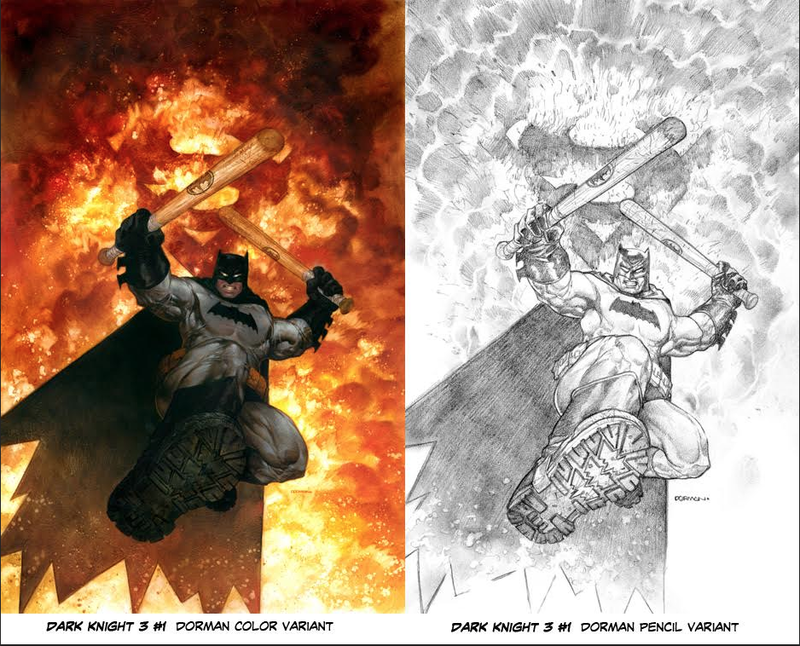 Starting today, I will be offering for PRE-SALE two very anticipated upcoming Dorman cover Variants. 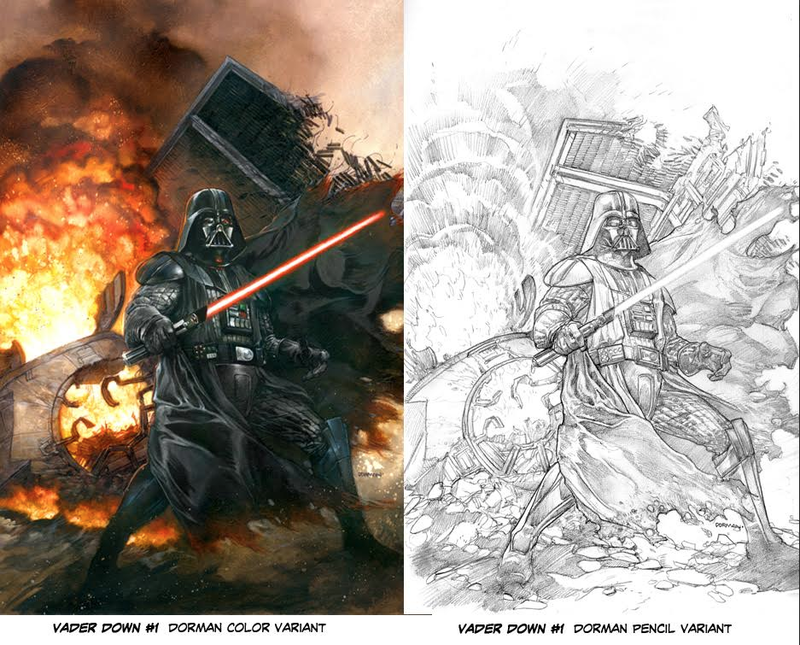 These variants are being offered in 2 forms: A full color painted version and a a black and white pencil version. And now… THE REVEAL! I once again have worked with M&M Comics in San Antonio, producing variant covers for two of the most anticipated books of the season... Marvel’s VADER DOWN and DC Comics’ DARK KNIGHT 3. I am offering these for presale now with the release of DK3 on Nov. 11th and VADER DOWN on Nov. 25. AND… as a special HALLOWEEN TREAT (and extended thru’ my son Jack’s birthday,… the boy needs new shoes) all orders of the full set of 4 books will get a copy of my ARCHIE # 1 Variant AND my SPIDER-GWEN #1 variant for FREE!!! 6 books variants for $60.00!! Now THAT’s a treat if I ever heard one! Thanks again for all your support of my work and I hope everyone has a safe HALLOWEEN and continued health and safety through the upcoming holidays! Here’s the premiere of my variant cover for Marvel’s “Vader Down” #1. This book will be shipping in November. I will be showing how I painted this in his future blog posts over the next week, so watch for those here. This original art will also be displayed at my appearance in Joliet, IL this weekend at Heroes Expo (https://www.facebook.com/events/363719340495946/). I hope you can come out & see me if you’re in Chicagoland. I will also be appearing at New York Comic Con in October. The Joliet Public Library in Joliet, IL has the World’s Largest Star Wars Library Event – a lot of the 501st Legion members join me there every year to help celebrate Star Wars. Here is information on it, and I hope if you’re in Chicagoland and you’re a fan of Star Wars, you can join us. I will have prints for sale and will be selling sketches and more. 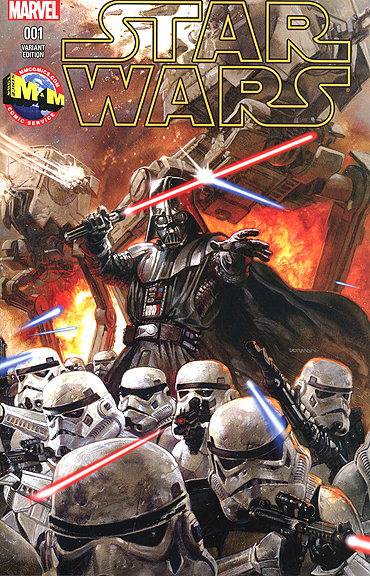 STAR WARS Variant Comic #2 Pencil Art by Dave Dorman, On Sale Now! 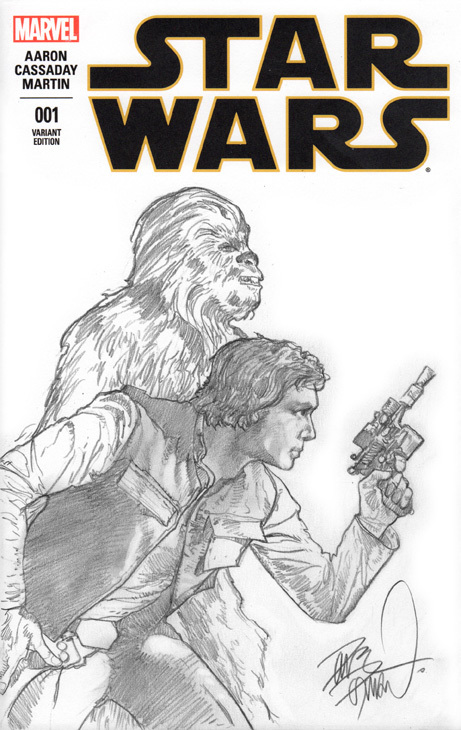 Han and Chewie Pencil Art by Dave Dorman, On Sale Now! 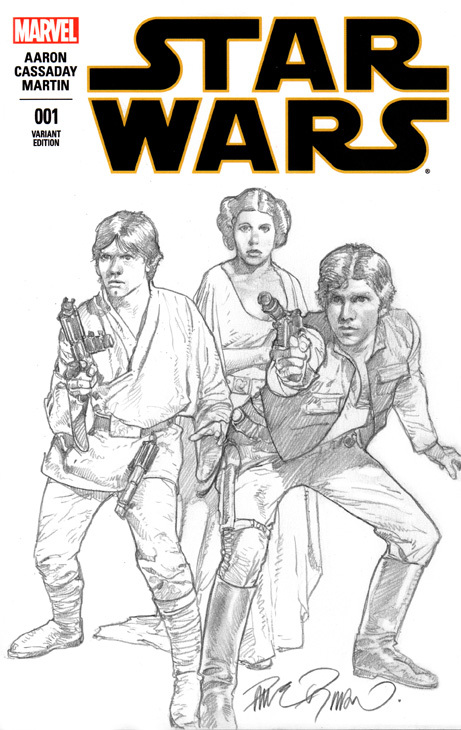 Luke and Leia STAR WARS Pencil Art by Dave Dorman, On Sale NOW! 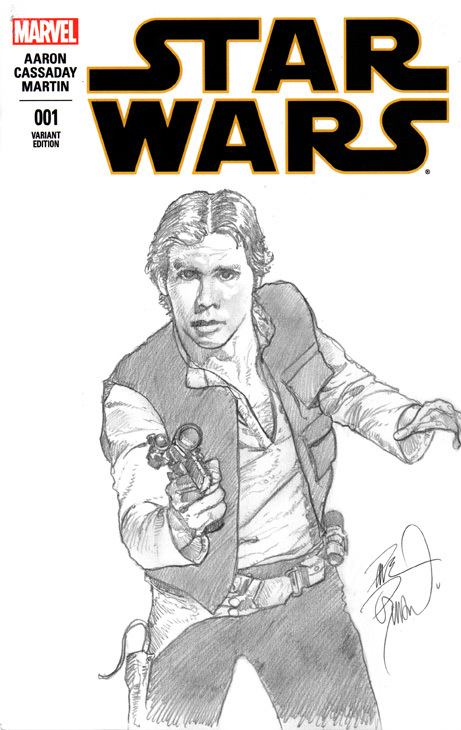 Han Solo STAR WARS Pencil Art by Dave Dorman, On Sale NOW! All of the pieces have their own Paypal buttons. These are one-of-a-kind artworks, and once they are sold I will remove them from the page. I hope you see something you like, and thanks again for the support of my work! 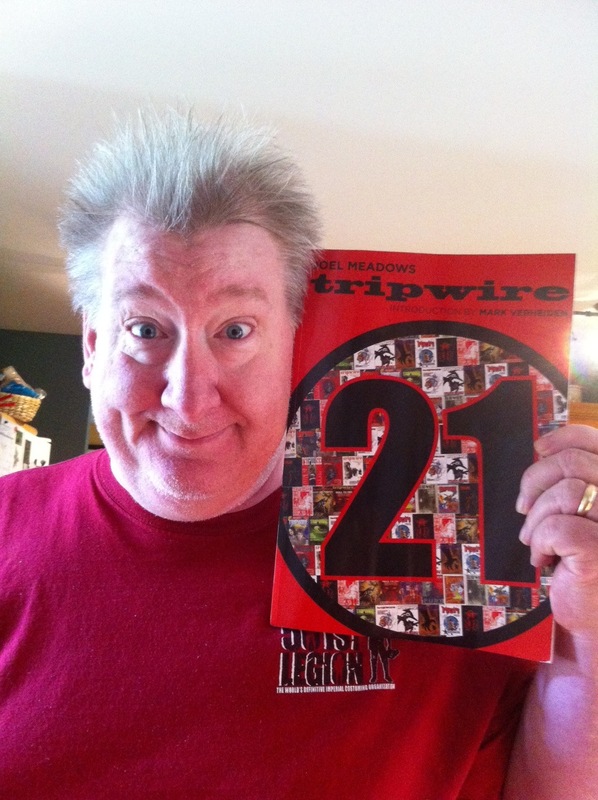 I am now selling my variant cover issue for $25 including postage and insurance. I have a very limited number of these so please do not hesitate in ordering. I must limit the purchase to one copy per person. I will remove the page when I have sold out. (It is possible I may get more in the future, but that is not guaranteed). It’s great to be back doing more Star Wars covers! I look forward to creating more great art for Marvel. 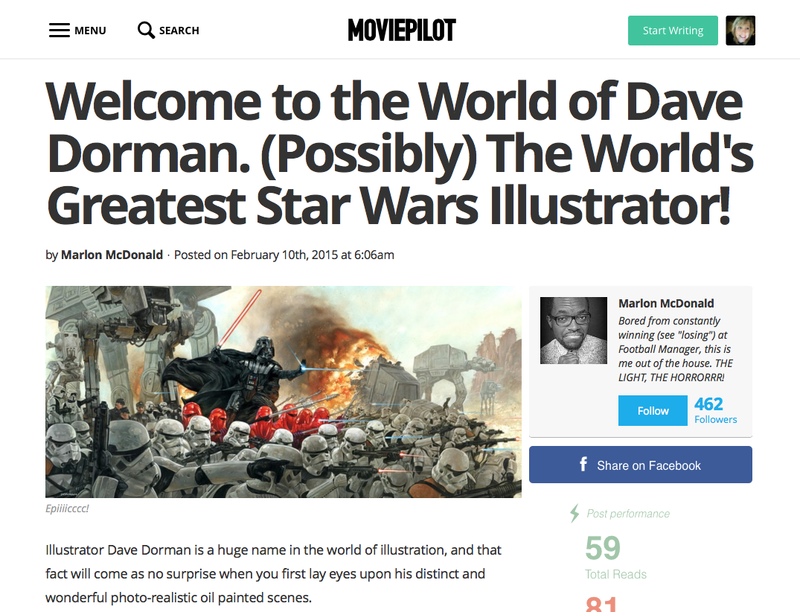 Thank you all for following me as we move into a new era of Star Wars! 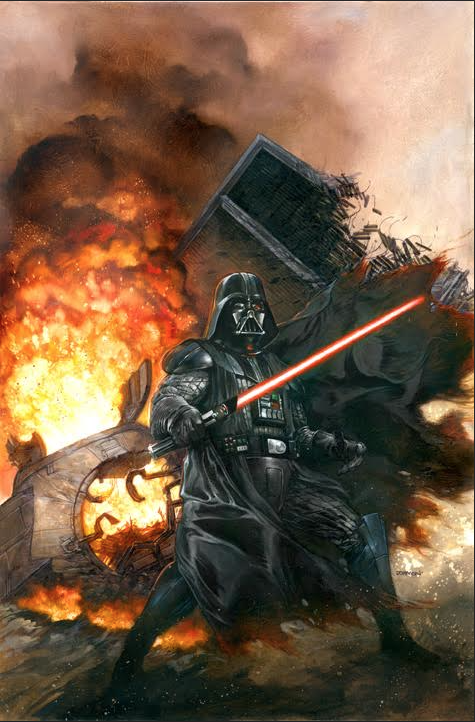 I’d like to take a moment to clear up some misconceptions and explain my thoughts on creating my painting “Lord Vader’s Persuasion…” The main reason for creating this piece was to show Vader leading his troops into battle. I wanted to actually show him in the midst of his beloved 501st Squad, being the leader he was born to be. This was not a scene we were able to see in the films themselves, and obviously, it would be a scene taking place between Episodes 3 and 4. 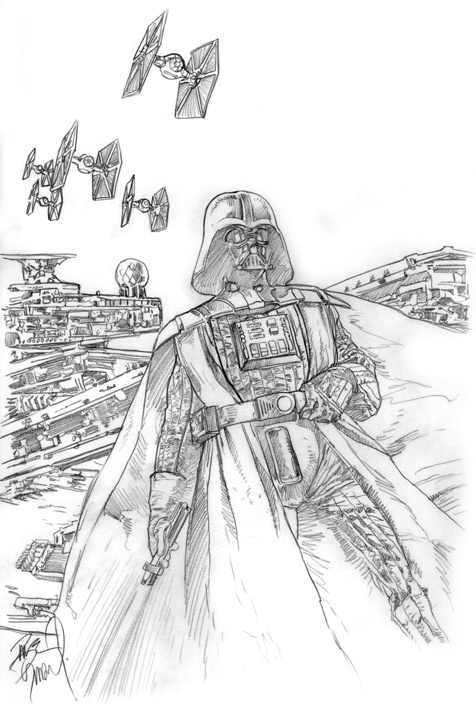 This art has caught the imagination of Star Wars fans around the world, and has inspired me to create other scenes capturing potential story elements that were not in the screenplays, but are part of the canon of the Star Wars history. The two most confusing elements of Lord Vader’s Persuasion are the inclusion of the Imperial Guards (the red armored figures surrounding Vader) and the fact that Vader is rising above the squad. The Imperial Guards were introduced in Episode 6 as visual elements in the background, in scenes featuring the Emperor and Lord Vader. They are not exclusively the Emperor’s private, but the elite of the Imperial forces used to protect those of the highest power. So the Imperial Guard would certainly be on hand to protect a high value target such as Vader during an invasion operation. 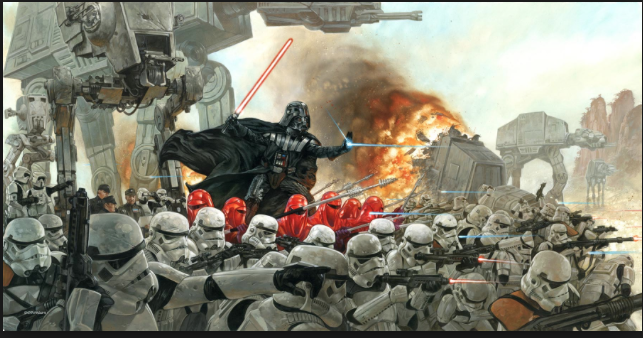 Vader’s loyal 501st troops form a phalanx around them, always pushing forward towards Victory! Why is Vader above the troops? He is not on a hoverboard, nor is he standing on a trooper’s shoulders! We know from the end of Episode 3 that Anakin/Vader is fearless in carrying out the Emperor’s order. Why would Vader not be fearless in leading his Troops into battle? Like any commander worthy of his troops’ respect, he will join them in battle. And as a powerful leading figure, he will not hide behind his troops, but will be where they can see him and be inspired by him. 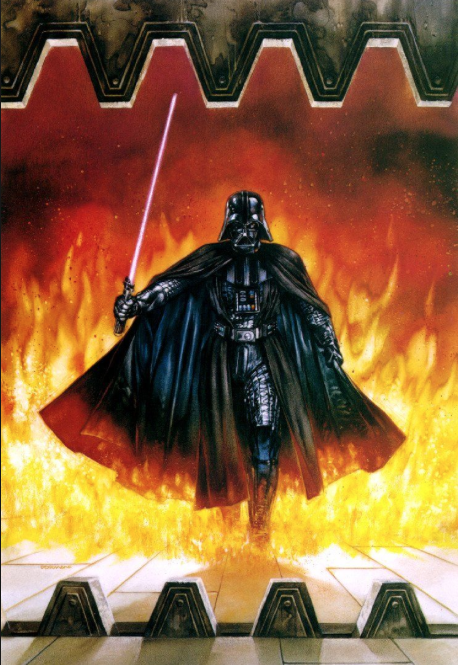 During the course of the battle, Vader uses the FORCE to levitate himself above the fray, leading and directing his troops ever forward, knowing he will become the primary target of his opponents. He is unafraid because he uses the power of The Force for protection. I have also taken an artistic license and compacted the field of battle so that I could show a few other elements that would be involved in this type of skirmish. The officers and scouts to the far left would not so close to the battlefield in a real situation, and the ATAT/ATSTs would not be so packed together. But the art I wanted to create would show the full impact of all elements of the Imperial Forces, so I pulled a few visual tricks out of my creative hat. Aesthetic Placement of Elements in the Art: Speaking artistically about the art, there are reasons I put elements where they are in the art. As you can see, there is an explanation for what is the battle scene from a “warfare” point of view. But to paint what I wanted, I had to have both an “Artistic” reason and a “Realism” reason. When laying out the the art, the first thing I noticed artistically was that the piece was primarily black and white. Black and greys in the Vader figure and white and greys in the trooper armor. I found working the Imperial guard into the piece not only added a focusing element, to bring your eye towards the main element–Vader–but also added that bold stroke of color I needed. That red would eventually tie in with the red of Vader’s lightsaber and the red/oranges of the explosions in the background. With that element of red, it was no longer necessary to add another bold statement of color, because the contrast of the dark figure of Vader made him the focus against the whites and the greys of the rest of the piece. One Last Visual Element to Note: There is one last visual element that you may not see right off, but if you look closely at the art and let your eye roam, you will probably focus on Vader first, then follow the line of his arm and hand deflecting the blasterbolt. 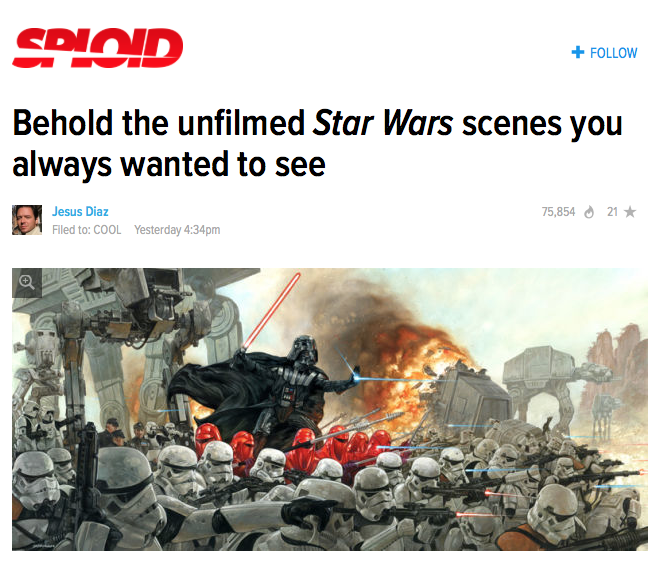 Your eye will follow the red of the ATAT explosion and smoke back over Vader, then follow the path of his Lightsaber back down to the far left of the art, now seeing the Officers and Scouts. As your eye follows where they are looking, it catches the front-most Stormtrooper with his arm raised, pointing the troopers forward. 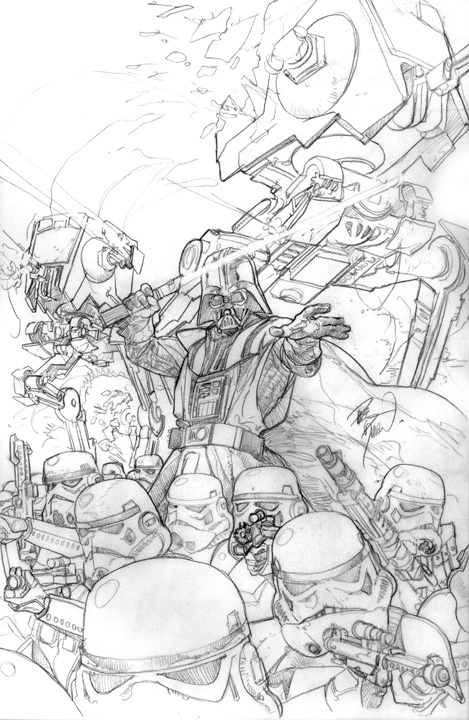 We follow that line through the bottom of the art into the field of troopers. From here, the curve upward of the red and blue blasterbolts brings the eye back up to the exploding ATAT in the background and then right back to Vader. There was much more that went into this piece and the contribution of the 501st Midwest Garrison in helping me shoot reference for this cannot be overstated. But this should help you understand a bit of what is going through my head when creating a piece of art. Happy Fourth of July to my U.S. Friends, and Happy Saturday to my Worldwide Friends. I thank all of my military family for their service to our country today. Please be safe and remember that the spirit of independence lives in each and every one of you. As a military brat, I appreciate your service. As Jack, Denise and I were hanging our U.S. flag in front of our house this morning, we each expressed thanks that we are living in the most free country on earth, no matter how bad things look right now. Our Founding Fathers had a vision that has lasted well over 200 years, and that vision is still valid today. We just need to continue working hard to fulfill that vision. May God bless all of you, and may God continue to bless America. So…here in the U.S. we have Benghazi-gate, the NSA, the IRS, and journalists being persecuted…but do you want to see something really scary? (Me…taken this morning). On Saturday, July 13th, I will be exhibiting at Comic Book Mania, held at the Gail Borden Public Library in Elgin, IL from 10-5 and curated by Bob Cassinelli, so please join all us of there if you can. The Chicago winners of the Writers & Illustrators of the Future Awards will be there with me. For those of you looking for me at the American Library Association event last Saturday in Chicago, my apologies for being unable to attend. My father-in-law was ill, and it was a little touch and go for a while. A special thanks to all of you who joined me in helping my friend Steve Smith of Alaxis Press Kickstart his Schuiten and Peeters THE LEANING GIRL graphic novel, English edition. He actually went above his $30k goal, so this has been exciting to watch get funded. I know Steve appreciates it very much. A Happy Independence Day to all of you, and remember: if you’re lighting off fireworks & beyond, please be careful.